Tourtière, also known as pork pie or meat pie, is a traditional French-Canadian pie enjoyed throughout Canada and New England. 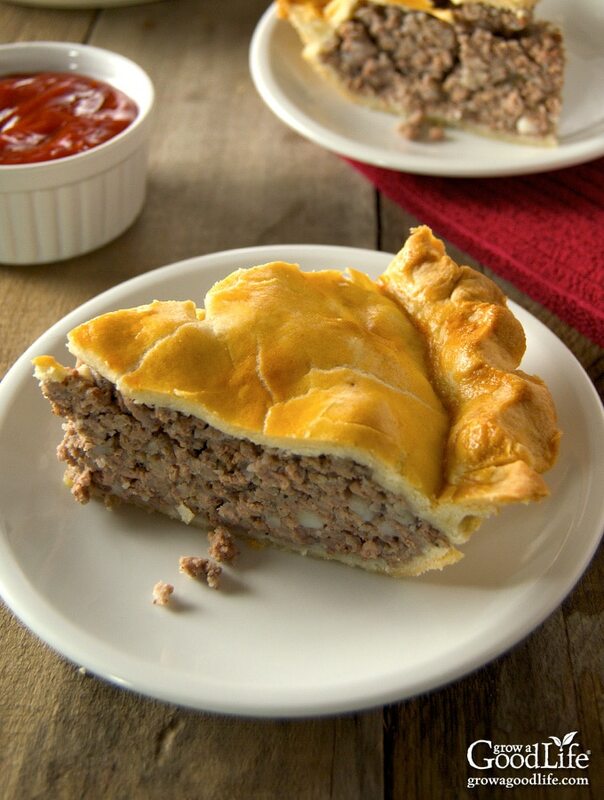 It is made from a combination of ground meat, onions, savory seasonings, and baked in a traditional piecrust. Growing up in a Northern New England paper town provided an eclectic upbringing of various nationalities and traditions. Like most mill towns, employment opportunities summoned immigrants from all over the world including Russia, Scandinavia, and Ireland. However, the largest immigrant group by far was French-speaking Canadians. Employment opportunities at the many saw mills and logging camps drew numerous French Canadians south in several waves during the 19th century. Eventually, many French Canadians seeking work and preservation of their customs, language, and way of life relocated to New England towns. They settled, established Franco-American communities, and maintained their culture, language, and religion. My family is mostly of French-Canadian descent, and I grew up in a bilingual French and English speaking small town. 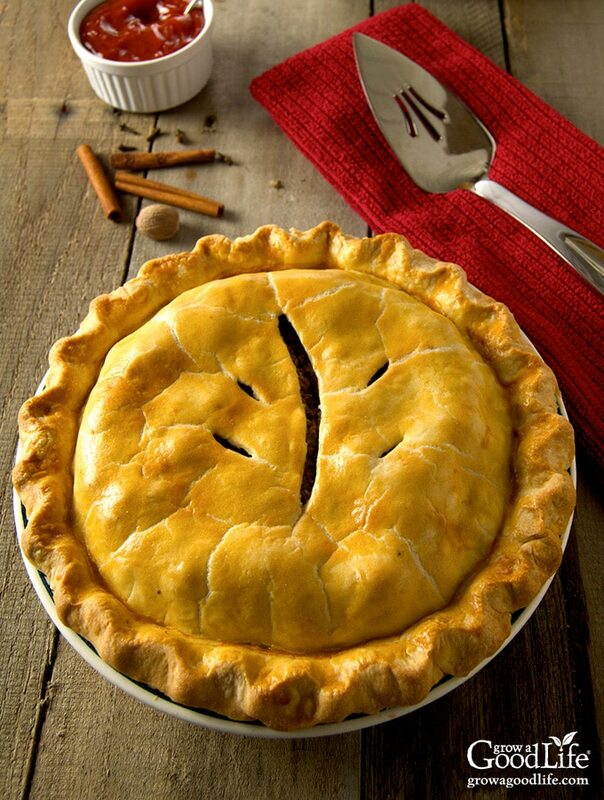 Among the customs passed down from generation to generation is the tradition of serving tourtière for special occasions such as Christmas Eve. This celebration meal was an adaptation of réveillon de Noël of rural Québec. As our family Christmas traditions continue to evolve over the years, I often think about the old-fashioned customs and foods from my youth. I remember attending Midnight Mass on Christmas Eve, then returning home to feast on meat pies smothered with a generous amount of ketchup before we were ushered to bed so Santa could deliver presents. As the years went by, and family members got older, the tradition of Midnight Mass gave way to Christmas Eve Mass at an earlier hour but the ritual of serving tourtière after Mass continued for many years. Tourtière, also known as pork pie or meat pie, is a combination of ground meat, onions, spices, and herbs baked in a traditional piecrust. 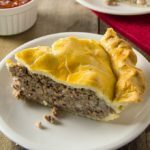 There are many variations of tourtière throughout the regions of Franco-American communities and Canada and even among members of the same family. Most recipes include a combination of ground pork and beef, but it is not unusual to include venison or other game meats in the pie. Almost every family had a tante or mémère (aunt or grandmother) who had a tourtière recipe with a secret ingredient or two. Some versions of tourtière are made from only ground or chopped pork, but my family always made it with a mix of pork and beef. Several accounts suggested that using potatoes was frowned upon because that meant you could not afford meat. In this recipe, I feel the potatoes are essential to help bind the ingredients together. The poultry seasoning that is historically used by many families in New England is Bells Poultry Seasoning and is still made today. If you can’t find Bells, go ahead and substitute your favorite poultry seasoning. Prepare your pie dough pastry and refrigerate until you are ready to use it. Cook the potatoes in a pot of boiling water until they are tender. Scoop out about 1/2-cup of potato water and drain the rest. Mash potatoes and set aside. Step 1. Add the onions, garlic, ground beef, and ground pork to a skillet over medium heat. Cook until the meat is no longer pink. Drain off any excess fat. Step 2. Combine the seasonings in a small bowl and add to the meat mixture in the skillet. Step 3. Add the reserved potato water. Mix well and simmer until the liquid has evaporated. Step 4. Turn off the heat and stir in the mashed potatoes. Let it cool as you roll out your pie pastry. Step 5. 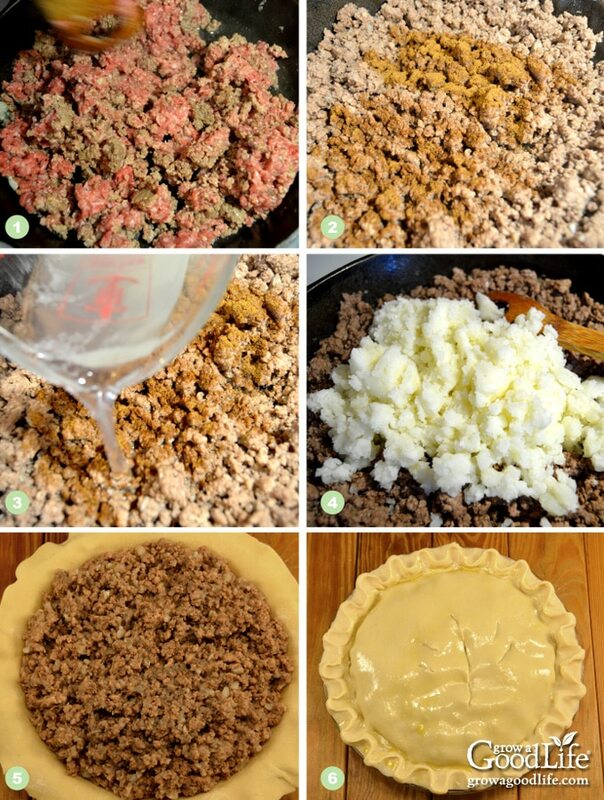 Place the bottom pastry into the pie plate and add the meat filling. Brush around the outer edge with beaten egg and add the top pastry. and place on top of the filling. Step 6. Crimp the edges, brush with egg wash, and cut vent holes. Bake in a preheated oven until the pastry is golden brown. Let is cool for about 10 minutes, and serve warm with lots of ketchup. Tourtière, also known as pork pie or meat pie, is a combination of ground meat, onions, spices, and herbs baked in a traditional piecrust. In a large bowl, combine flour with the salt. Cut in butter or lard until mixture is a roughly even crumbly texture. Add water and blend just until dough comes together. Shape into a rough disc, wrap and chill in the refrigerator. While pastry is chilling, prepare filling. Cook potatoes in a pot of water until tender, about 12 minutes. Reserve 1/2-cup of potato water and drain the rest. Mash potatoes and set aside. In a large skillet, cook the onion, garlic beef and pork over medium heat until no longer pink. Drain off excess fat. Combine the seasonings in a small bowl and add to the meat mixture in the skillet. Add the reserved potato water. Mix in well and simmer over low heat for about 10 minutes until the liquid is absorbed. Remove the pan from heat, stir in mashed potatoes, and set aside to cool. On a lightly floured surface, divide dough in half and flatten one ball of dough with your hands. Roll dough to about 12-inches in diameter to fit a 9-inch pie pan. Place the pastry into the pie plate and add the meat filling. Brush around the outer edge of the pastry with the beaten egg. Roll out the top pastry and place on top of the filling. Fold the top crust under the bottom crust and pinch or flute the edges. Brush with egg wash and cut vent holes. Bake in a preheated over for 30 to 35 minutes or until the pastry is golden brown. Remove the tourtière from oven and let it cool at least 10 minutes before serving. Yield: Makes 1 pie, about 8 servings. This recipe was originally published on December 14, 2015. It has been updated with additional information, photos, and video. Does your family have traditions centered on food and meals? What family traditions do you carry on? All my French aunties made a lot of meat pies before Christmas. Mostly they would freeze them and pop them in the oven for all the friends and relatives who dropped in during the holidays. They were always served with ketchup and a simple tossed salad. So delicious! Diane, That sounds like my family too! Thanks for sharing. Wonderful recipe, thank you. I was trying to find one my grandmother used to make and this was very close. I increases the cloves, and bells and pepper an additional 1/2 tsp. I also served it with a homemade brown gravy. Will make this a family tradition from now on. My bottom crust never comes out flakey. I have check oven temp with a probe. I am sorry to hear that. I like baking pie in a glass pie plate. It makes it easy to see when the bottom is brown. Try brushing the bottom crust with your egg wash before adding the filling. Very sorry for your loss. I lost my FIL ON 10/23/18 and he, too was the pie maker in the family. The weekend before he died, I made this recipe and brought him a slice since we knew he wouldn’t be around for Christmas. He pronounced it to taste “just like his memere’s” and made us promise to have a Christmas celebration at his house with more tourtieres. I’m making them now in his memory and baking them tomorrow in his oven. He was a wonderful man who too, enjoyed cooking. Thank you for this recipe. It sounds yummy! I have made this pie before and it has come out well but this has more spice so we will see. Again, thank you and God Bless all the cooks that have taught us so well. Brenda, I am sorry for your loss. I hope you enjoy the recipe and it brings you warm memories. I’m just reading these posts and can’t help but be amazed by so many similarities in family traditions. Rachel, Your last name is the same as my cousins (my aunt married an Arsenault). They live in Montreal. My mother was Canadian, from PEI and my father was French Canadian from Magdalen Islands (our family name is LaFrance). My mom always talked about making meat pie for Christmas eve but made it with pork shoulder. I will be making one this year! Oh, and we grew up in Chicago. My family and I celebrate réveillon over Messenger video call in spite of the 7-hour time difference, it’s not Christmas until I’ve seen and heard them. Thanks for your comment Meri! It is amazing how food can remind us of family. My mom made something similar to this. She was Canadian French & grew up in Westbrook, Maine. She would have the person in the Meat Department triple grind the pork (she didn’t use beef at all) & would grind ,the potatoes,onions,mixing them together with the pork & the spices before putting it into pies without cooking the mixture. Rachel, beautiful tourtiere! I first made one two years ago for my husband in honor of his sister who had recently died. They’re my French Canadian connection. I grew up with many traditions and one of them was French meat pie The recipe was handed down to me from my memere and my mother. Ground pork is boiled with salt, pepper and onion. Potatoes are cooked, mashed down no milk. Ground pork and potatoes are mixed together. Add allspice and put into pie shell. Add ketchup to this and enjoy. Funny how my French dressing recipe is basically made the same way but no crust. This has now been passed on to my children. My Memere on my mom’s side made it with potatoes. My Memere on my dad’s side made it with crushed saltine crackers. That is how I continue to make it. It is always a great hit around the holidays. Instead of potatoes, I bake 6 pieces of toast in the oven until golden brown. I wait until they are completely dry and then I smash them until fine and add them to the meat. My meme told my mom that this was the key o a good pork pie and I have always one it this way. My pies are a delicious holiday treat that everyone enjoys! Lisa, Thanks so much for sharing! I love how everyone has their own version of pork pie. I love how you are preserving and passing on a cherished family recipe. I grew up in Berlin too. This was a regular yearly tradition at home for us too. Our old family recipe uses twice ground fresh ham. We season with only salt, pepper, and sage, with potato and onion as well. The potato helps good it together, flavor is amazing with pork and sage. Usually make 9 pies for Christmas breakfast, the entire family comes together every year. Traditions are wonderful! Melonia, That sounds like a delicious variation that is perfect for breakfast! MY Aunt Harriet would make this pork pie which we would eat after returning from Christmas midnight mass. We lived in Farmington Falls. Maine. Saving this recipe to make. So many good memories! Thank you for sharing, Joline! I love hearing about how this recipe brings up warm family memories. My family did the exact same thing. It does bring back warm memories. 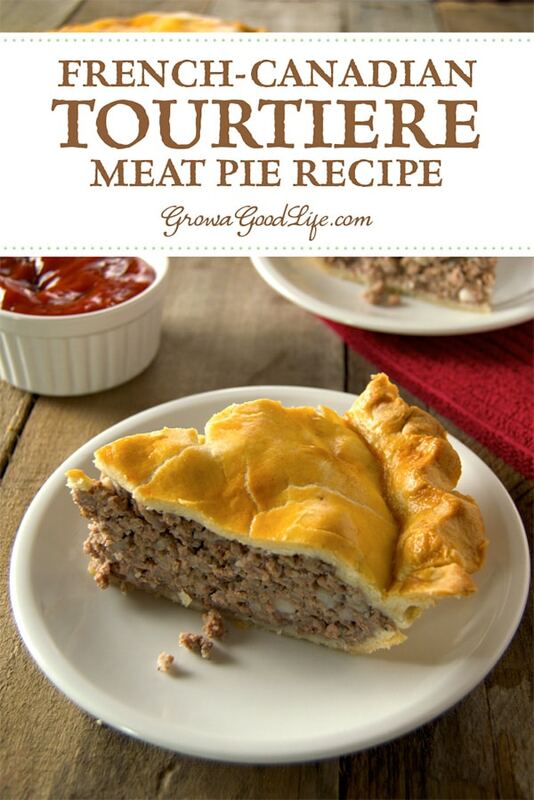 All these years, I thought “meat pie” was just a recipe from my mother’s Canadian family (she grew up in Pawtucket, RI). She made it every Christmas, and it was my dad’s absolute favorite. Once she died, the holidays were extra hard on him. I got the recipe from my sister and figured I’d give it a shot, praying the whole time I’d be able to replicate it. On Christmas Eve, I set it down in front of him (slathered in ketchup, of course)…he took one bite, his eyes filled with tears, and he said that just for a brief second it felt like she was there with him again. It was the best thing he’s ever said to me, and of course I cried like a baby over that one! I just stumbled across your column and your recipe is almost exactly as my mom had it written. I loved reading all of these comments from readers whose families have shared the same traditions my mom and dad gave us growing up. Best to you!! I am half French Canadian, born in Woonsocket RI but we moved away when I was 9, so the tradition of meat pie was left behind…sadly! I remember loving it! Aunt Blanche and Memere made it but my Irish Mother made meat stuffing, which was probably a variation of the pie. I have looked and looked for a recipe for the meat stuffing for years, but could only find sausage stuffing. I make my own version of meat stuffing and it’s a family favorite, but I have always wished I could find an original recipe. This must be very close to it…but my Mother used bread crumbs, not potatoes which makes no sense because the Irish love their potatoes! Thanks for the trip down memory lane…merci beaucoup! Oh… you definitely must use ketchup or chili sauce or a combination!! My French Canadian Great Grandparents have passed this down for more than 175 years. Midnight mass was the tradition but now we do it earlier on Christmas Eve. My Grandmother told me it originated because it absorbed all the alcohol consumed after church! . We never use potatoes , garlic or poultry seasoning. We do use allspice. We also were taught to add water to just cover the meat as it was cooking. Added a bit of white bread to absorb some liquid. Best tip that makes the most difference is to have your butcher grind it twice. I pick out 8 pounds of pork shoulder and 8 pounds chuck roast. My brothers and there children all try making them but no match to mine.? Actually all the men in our family do the preparation. Great tradition that never gets old. Hi! Thanks for a great recipe! I have never made this before and today was my first time! The only think I noticed is that when I cut into it to serve it the filling was kind of dry and falling out of the pie. Any suggestions? Thanks! Darlene, The moisture content will vary depending on the meat. Baking it in the oven will dry it out a bit. Did you add the water in step 2? If so, maybe next time try simmering for a shorter period and leaving the mixture a little more moist. When I have made pork pie, I always have a problem with the bottom crust being soggy. Suggestions on how to prevent that? It happens with store bought frozen pork pies as well as those that I make from scratch. Barb, There are so many reasons for a soggy piecrust. Some examples are a filling that is too wet, cracks or air pockets in the bottom pastry, or not cooking the pie long enough. Not knowing your situation, I can only share what I do. I use a glass pie plate, drain off extra fat from the meat filling after step 2, and bake until the bottom crust browns. I have never had a meat piecrust that was soggy. I hope these steps help. My Mother taught me how to make meat pies may years ago and always told me to brush egg yolk on the pie crust before adding your meat which seals your crust and prevents it from getting soggy. It works! Great tip, Kelly! Thanks for sharing! Try the Publick House in Sturbridge Mass, my family is from there and my dad was a bus boy many many years ago, their pie is the BEST!!!! I GET IT EVERY TIME I GO TO VISIT. I am going to try this recipe. My dad was from French Canadian, English and Sioux stock in Minnesota. Mom made French meat pie with cranberry sauce each Christmas. It’s time for me to do the same! Looks gorgeous! I loved enjoying this for holiday meals in my family. When my cousins and I were children, we had Christmas Eve at my French-Canadian-American grandmother’s, after evening mass. She always made pork pie. This September, Gram passed, two weeks shy of her one-hundred-and-second birthday. I’m making the tortiere, in her memory, tonight, Christmas Eve, even though I’m the only one in attendance tonight that was at her get togethers. Great memories. Thank you for the recipe! God Bless your mom! My did she live a long life, wow! I only hope I’m as lucky! I know this is a year later but Merry Christmas to you & your family! I’m making French meat pies this year my God Mother’s funeral was just last sat.& my mom passed 2 yrs ago right around mother’s day , they are Canadian French from North Troy Vt. & 2 of 18, we always had tourtieres on Xmas Eve but I never made them, I can’t find my Mom’s recipe and she kept them A Secret from everyone, cause her and her sister in laws had this secret thing going on for years!! This looks delicious and I’m planning on making it for my boyfriend and I for Christmas! Does the dough have to chill for a certain amount of time before rolling it out and adding the filling? Yes, per the instructions #2 for the pastry, pop the dough in the refrigerator before you make the filling. You can chill it longer too if you are breaking the tasks up over a few days. I am making the filling right now and assembling tomorrow to have on Christmas Eve, as always. My father was English, but my French Canadian mother was from Trois Rivieres. Her family also followed the Midnight-Mass-then-Tourtiere tradition when I was a kid. Your recipe is nearly identical to ours, minus the garlic and adding pinch of allspice. Now I am a Protestant pastor’s wife, but also a Mémère, and still make this for a new generation. Thanks for the post! Armande, You could try adding a little more of the other spices to balance the flavors. Rosemary, You can freeze the meat pie after assembling or after baking. Either way works fine. Use a metal or foil pie plate and you can go from freezer to oven. I prefer to bake and cool, then wrapped and freeze. That way it takes less time in the oven at serving time. Bake until heated through, about 30-45 minutes. You can also freeze the pie once assembled, before baking. It will take longer to bake, probably up to an hour in the oven. With either method, be sure to cool the pie quickly after cooking or filling. Place the pies into the fridge to cool, then wrap and freeze. Don’t let the pies sit out at room temperature for longer than two hours before you reheat them. fiancé. He was very impressed as was everyone else at the table! Easy recipe and directions!! Thank you for sharing! Sharon, I am so happy to read your comment. Thank you! Thank you for this recipe! My husband’s Mother was a Tremblay from the Gaspe. I am going to make this for him he will be so happy, and I will also make extra for his siblings. Jan, thank you so much for your comment. I hope the flavors bring back warm memories of family. Grew up in Livermore, ME. French Canadian family. Family worked in paper mill all lives. Grandmother “Me Mere” made this pie. You took me back and I thank you! Will be making tonight and thinking of how happy she was to cook and share ?. Thank you for making my day! Jerry, Thank YOU for your comment. I hope you enjoy your meat pie. I think we must be from the same town! Reading about the recipe brought back memories of a time long ago. It was a wonderful place to live and raise children. We were all family there. I miss the French masses. Can’t wait to make the pie! Thank you! I just thought I would let you know that the printable recipe does not have the lard/butter for the pastry in the ingredients. My dad always made meat pie that his mother passed down to him. I had the recipe but lost it long ago but the one thing I was sure of was that he used Bell’s poultry seasoning. I searched many recipes and while I found some that had sage and thyme and other spices found in Bell’s I could now find a recipe that specifically called for poultry seasoning. Until now. Thank you for the recipe. Qis t possible to freeze the tortiere once all the ingredients are assembled- before cooking? To used later??? Jane, Yes, you can freeze it once assembled. Use a metal or foil pie plate and you can go from freezer to oven. I will take longer to bake, probably up to an hour in the oven. Yes. It freezes well; just takes longer to bake. This recipe is the closest I’ve ever seen to my mother’s. We grew up in Woonsocket, RI, which had a very large population of French-Canadians working in the textile mills. I still make it at Christmas. My grandfather always made meat pies for Christmas, Love and miss him very much. Hope they taste as good as his, will love them. We always have ours for breakfast Christmas morning. My mom was English, my dad French Canadian….so as a compromise we had it for breakfast instead of after midnight mass. My mom’s secret ingredients, some Bisto and a bottle of beer. Trust me everyone always loves it! My mom made something similar; sometimes she would put an egg or two in with the meat.we all loved it. Will try this one….see if it stacks up. Her’sister was always a favorite and there was not a recipe, most of her cooking was from memory. Hi Rachel! Oh, this looks wonderful! I’m sure my family would love it. We’re going to be relocating to northern New Hampshire in a few weeks, so I’ll have to make it at Christmas time. So nice to know that this is a local favorite. 🙂 Already pinned. Thanks! I’ve always liked tourtiere 🙂 I live in Quebec and now that I’m a mom I make it for special occasions. It’s worth to make it fresh. Thank you for sharing! We had our ” Reveillon ” religiously each year. And after midnight Mass as custom. And I pass it on to our children’s. But the ” fat ” content is too high for today diet as one’s age’s. Also, after, mom played violin, Aunt played accordion, granddad played the clarinet, and uncle played the spoons. Played music for two to three hours. I loved the music. Roger, Thank you for sharing your warm memories. I remember some very fatty meat pies over the years. That is the great thing about grinding your own meat, you can adjust the amount of fat that is included. In my family, the filling was made mostly with ground beef and was used to stuff the Christmas turkey, with enough extra filling for the meat pies, which were then served for New Year’s. Yes…my mother used only meat stuffing for chicken and furkey. French-Canadian. Thanks for sharing on Let’s Get Real Party. Looks delicious! I love traditions, especially those that surround the Christmas season. My husband’s family is French Canadian and they also celebrated the reveillon with midnight mass and then a party afterwards with Tourtiere. We’ve moved the party to before midnight mass as we’ve gotten older, but we still have the meat pies. We love it for breakfast the next day with eggs! Thanks for the recipe. I’ve never personally made one, but I know Meme was going to try and teach some grandkids this year! I’ll show her the recipe to see if this is similar to how she does it. There are many recipes with little tweaks, but none are as good as the ones grandmothers or moms made. Even though the ingredients may be the same or similiar, it takes the love and traditions to make them the very best.